McRae 3724 Men's Freedom Hot Weather Desert Tan Military Boot was designed for a running shoe feel with the protection of a military boot. This boot features a 100% suede leather and nylon upper for maximum protection for your feet with a low weight penalty. An unlined upper makes this boot ideal for hot weather usage. 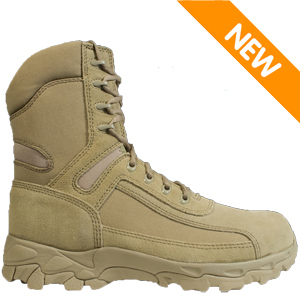 This boot is ideal for the soldier looking for a lightweight boot for sensitive missions that require agility and coordination. A highly cushioned EVA midsole provides excellent shock attenuation to save your joints. This boot is approved for Army ACU wear and is AR 670-1 uniform approved.